2016 has witnessed the achievements of many high-profile Indian American women from different walks of life, including Kamala Harris, a US Senator and attorney general from California; Pramila Jayapal, a social activist and founder of OneAmerica in Washington; Dr Renu Khator, President and Chancellor of Houston University; Piya Mitra, a cofounder of Induz in California; Dr Tina Shah, a White House fellow and pulmonary specialist in Chicago; Bay Area based documentary filmmaker Nyna Pais Caputi, MasterChef India Season 5 participant Anagha Godbole from San Francisco, and Jaya Kamlani, an award-winning poet & author from Atlanta. 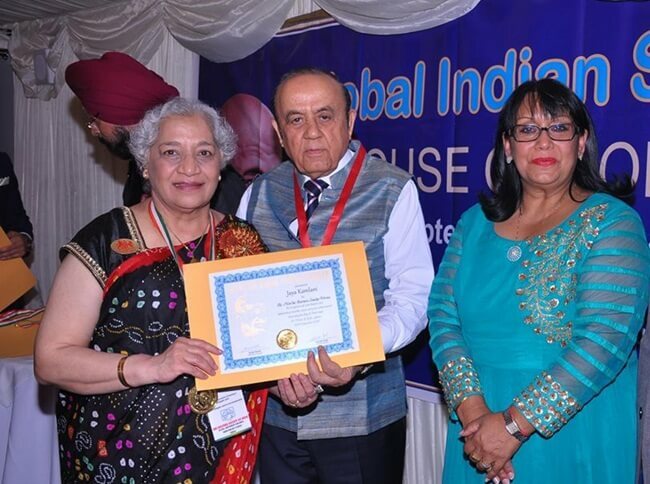 Jaya Kamlani from the Atlanta Indian community in Georgia recently received the Mahatma Gandhi Pravasi Samman Medal from the NRI Welfare Society of India in a ceremonious event held at the House of Lords in the UK. The award is presented to global Indians for their exceptional contributions and services every year. A former technology consultant in Silicon Valley, Jaya Kamlani is a published and celebrated author having three books to her international fame: “To India, With Tough Love”, “Scent of Yesterday,” and Garden of Life: A Poetic Awakening.” She debuted into creative writing and storytelling with her first non-fiction book, “To India, with Tough Love,” in 2013. The debut book is a capsule of her extensive research on how rampant corruption has led India to face various socio-economic and environmental issues such as poor sanitation, farmer suicide, toxic environment, trafficking, and exploitation of natural resources. Written with an aim to make people aware of how evil corruption is, the book features few social entrepreneurs who are committed change makers on various missions, and a number of sustainable solutions. Atlanta-based Jaya Kamlani’s second book, “Scent of Yesterday,” is a memoir, and her third book, “Garden Of Life,” is a collection of poems about war and peace. In her memoir of Mumbai (then Bombay) from the Partition of India to the post-Independence era, she creatively explores how the ordeal of displacement, the pain of partition, and cultural exposure to a new frontier shaped her views of the outer world in her growing years. “Garden of Life: A Poetic Awakening” is an enchanting manifestation of Jaya Kamlani’s yearning for peace amidst the heaps of ruins caused by the Vietnam War, the 9/11 tragedy, the Syrian War, American invasion of Iraq, and corporate war on America. Her poems seek to unite people, irrespective of their faiths, cultures and religions, against hatred and violence that have been plaguing the world for ages. A graduate of St. Xavier’s College, Mumbai, she relocated to New York for better opportunities in 1969. Misted about the socio-economic emancipation and empowerment of women in America by the popularity of such Hollywood actresses as Katharine Hepburn, Elizabeth Taylor and Jane Fonda of her times, Jaya Kamlani encountered American women’s fight against gender inequality and for equal opportunity. In 2016, Jaya Kamlani also received the Bharat Samman award (Pride of India) from General V K Singh, the Minister of State for External Affairs, and the Hind Rattan Award (Jewel of India) from Dr. Bhishma Narain Singh, President of the NRI Welfare Society of India, for her contributions to the progress of society as an author. Travel Beats is an Indian American Community Portal by IndianEagle, a leading travel partner of Indians in USA. Travel Beats publishes the latest news and stories of and from the Indian community in America.